Atal Bihari Vajpayee (Hindustani pronunciation: [əʈəl bɪhaːɾiː ʋaːdʒpai]; 25 December 1924 – 16 August 2018) was an Indian statesman who served three terms as the Prime Minister of India: first for a term of 13 days in 1996, then for a period of 13 months from 1998 to 1999, and finally, for a full term from 1999 to 2004. A member of the Bharatiya Janata Party (BJP), he was the first Indian prime minister who was not a member of the Indian National Congress party to have served a full five-year term in office. Vajpayee was born to Krishna Devi and Krishna Bihari Vajpayee on 25 December 1924 in Gwalior. His grandfather, Pandit Shyam Lal Vajpayee, had migrated to Morena, Gwalior from his ancestral village of Bateshwar, Uttar Pradesh. His father, Krishna Bihari Vajpayee, was a school teacher in his hometown. Vajpayee did his schooling at the Saraswati Shishu Mandir in Gwalior. In 1934, Atal Bihari was admitted to AVM School Barnagar Distt Ujjain after his father joined as headmaster. He spoke about his 'lifechanging moment' at a public rally on the 1996 Lok Sabha election trail. He said “But I learned a lesson that changed my life. I took a pledge I’d never rote-learn a speech. It was my first speech at AVM (Anglo Vernacular Middle) School,”. He subsequently attended Gwalior's Victoria College (now Maharani Laxmi Bai Govt. College of Excellence) for B.A. in Hindi, English and Sanskrit. He completed his post-graduation with an M.A. in Political Science from DAV College, Kanpur. During a BJP conference in Mumbai in November 1995, BJP President Advani declared that Vajpayee would be the party's Prime Ministerial candidate in the forthcoming elections. Vajpayee himself was reported to be unhappy with the announcement, responding by saying that the party needed to win the election first. The BJP became the single largest party in parliament in the 1996 general election, helped by religious polarisation across the country as a result of the demolition of the Babri Masjid. Indian president Shankar Dayal Sharma invited Vajpayee to form the government. Vajpayee was sworn in as the 10th Prime Minister of India, but the BJP failed to muster a majority among members of the Lok Sabha. Vajpayee resigned after 16 days when it became clear that he did not have enough support to form a government. Vajpayee's government introduced many domestic economic and infrastructural reforms, including encouraging the private sector and foreign investments, reducing governmental waste, encouraging research and development and privatisation of some government owned corporations. Among Vajpayee's projects were the National Highways Development Project and Pradhan Mantri Gram Sadak Yojana. In 2001, the Vajpayee government launched the Sarva Shiksha Abhiyan campaign, aimed at improving the quality of education in primary and secondary schools. In December 2005, Vajpayee announced his retirement from active politics, declaring that he would not contest in the next general election. In a famous statement at the BJP's silver jubilee rally at Mumbai's Shivaji Park, Vajpayee announced that "Henceforth, Lal Krishna Advani and Pramod Mahajan will be the Ram-Laxman [the two godly brothers much revered and worshipped by Hindus] of the BJP." Vajpayee's funeral procession moving to Smriti Sthal near Raj Ghat for last rites. Afghanistan: Former Afghan President Hamid Karzai was among several foreign dignitaries present at former Prime Minister Atal Bihari Vajpayee's funeral in New Delhi. He recalled that the departed leader was "the first to offer us civilian planes, Airbuses at the time we were starting out". Pakistan: Pakistan's interim Minister for Law and Information Syed Ali Zafar met External Affairs Minister Sushma Swaraj and extended Pakistan's condolence on the death of former prime minister Atal Bihari Vajpayee. 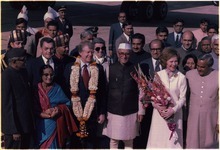 Zafar was among the foreign dignitaries who attended Vajpayee's funeral in New Delhi. Former Pakistani president Pervez Musharraf mourned the demise of former prime minister Atal Bihari Vajpayee, calling him a great man. He said that Vajpayee's demise was a great loss for both India as well as Pakistan. In 2012, Vajpayee was ranked number 9 in Outlook India's poll of the Greatest Indian. In August 2018, Naya Raipur was renamed as Atal Nagar. In October 2018, four Himalayan peaks near Gangotri glacier named after his name. ^ "Atal Bihari Vajpayee had his website as early as 1999 polls". ^ Smriti Kak Ramachandran (24 December 2014). "Bharat Ratna for Vajpayee, Madan Mohan Malaviya". The Hindu. Archived from the original on 25 December 2014. Retrieved 26 December 2014. ^ Muller, Tom (2012). Tom Muller; Tom Lansford (eds.). Political Handbook of the World 2012 (revised ed.). SAGE. p. 628. ISBN 978-1-60871-995-2. ^ a b Myra,, MacDonald, (1 January 2017). Defeat is an orphan : how Pakistan lost the great South Asian war. London. pp. 27–66. ISBN 9781849048583. OCLC 973222892. ^ "PARLIAMENT QUESTIONS, LOK SABHA". 2 December 2008. Archived from the original on 2 December 2008. Retrieved 17 August 2018. ^ Taylor & Francis Group. Taylor & Francis. Routledge. 2 September 2003. ISBN 9781134407583. Retrieved 17 August 2018. ^ "BBC NEWS | World | South Asia | Vajpayee to retire from politics". news.bbc.co.uk. 29 December 2005. Archived from the original on 23 November 2006. Retrieved 25 July 2017. ^ "To evade marriage, Atal Bihari Vajpayee locked himself up for 3 days - Times of India". The Times of India. Retrieved 18 August 2018. ^ McFadden, Robert D. (17 August 2018). "Atal Bihari Vajpayee, Former Prime Minister of India, Dies at 93". The New York Times. The New York Times. Archived from the original on 16 August 2018. Retrieved 16 August 2018. ^ Perappadan, Bindu Shajan (12 June 2018). "Atal Bihari Vajpayee stable; treatment continues". The Hindu – via www.thehindu.com. ^ Bureau, ABP News. "Former PM Atal Bihari Vajpayee's ashes immersed in Ganga at Haridwar". Retrieved 19 August 2018. ^ "Former prime minister Atal Bihari Vajpayee's ashes immersed in Ganga at Haridwar". www.hindustantimes.com. 19 August 2018. Retrieved 19 August 2018. ^ "Flags in Mauritius at half mast in Vajpayee's honour". The Economic Times. 17 August 2018. Retrieved 18 August 2018. ^ "Chhattisgarh Cabinet agrees to rename Naya Raipur as Atal Nagar". The Indian Express. 21 August 2018. Retrieved 21 August 2018. ^ "Chhattisgarh Govt Renames It's New Capital Naya Raipur To "Atal Nagar", Pays Tribute To Vajpayee In Unique Way". Headlines Today. Retrieved 21 August 2018. ^ "4 mountain peaks named after former PM Atal Bihari Vajpayee". India Today. Retrieved 6 November 2018.